It would be great if we could just study through osmosis, but sadly, it requires a bit more effort. And discipline is hard. Study buddies are one of the best ways to keep yourself on track. You are accountable to each other. You set shared goals, whether that’s to hit a certain wordcount or to work until a set time. It’s important that your goals are finite and achievable – try to hit 500 words or study for 45 minutes without opening Facebook, rather than memorise the entire Shakespeare canon. Ain’t nobody got time for that. It’s that much easier to get (and give) support. If you have a question about some of the material, someone will either know the answer… or they won’t, which is (guiltily) reassuring. Non-academic support is also vital. Having friends to vent to is a great stress-buster – and having someone who will motivate you to get up, get out of bed and into the library is priceless. Especially on a weekend. Lastly, study buddies make studying less boring! Poring over textbooks or endless Jstor articles gets a bit monotonous. If you’re studying with course friends, you can test each other, mark each other’s test papers, or talk over the material together. That said, if you’re working with friends, you have to actually work. Don’t take breaks too frequently – you’ll never properly settle into work. It’s also important you have the same expectations. Whether you work best in the morning or evening, prefer to be in the Library or in a café, find someone whose studying preferences matches yours. You don’t have to be in the same place, though – my friends and I have a WhatsApp group chat for studying where we share our goals and report in. Want a study buddy? You can either set up your own study group, or go and find a study buddy… and I do mean, literally find. For the last two weeks of Easter vacation, the Library will be hiding ten potential #WarwickStudyBuddy friends for you to discover. Follow the clues on Facebook, Twitter or Instagram – or just wander the Library and see if you can spot a little friend! 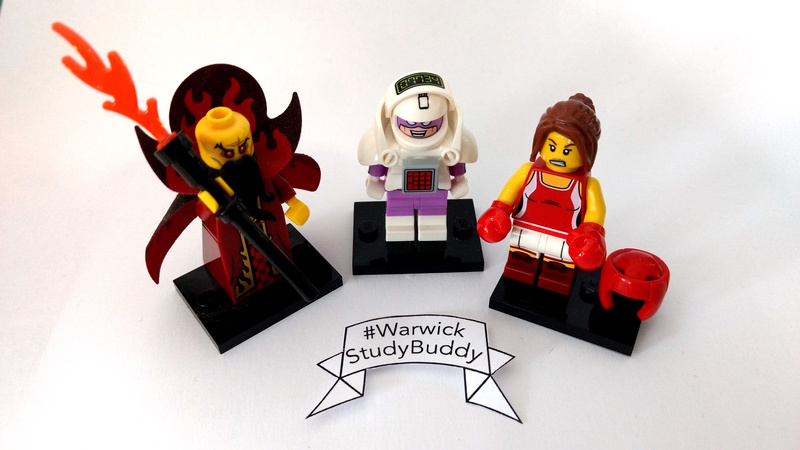 If you manage to find a #WarwickStudyBuddy, they’re yours to keep, gift to a friend, or even hide again for another student to find… just let the Library know whether they’ve been found.